cancer free: Bigger Tasks, Done a little slower! Bigger Tasks, Done a little slower! Last year was the worst weather for my tomatoes in my memory. Spring came late, wet and cold. Fall came early with winter rains making it the shortest season ever. If I had to pick a time to get cancer I couldn't have chosen a better one. I was officially retired and collecting Social Security, haha, just like old people! But between the cancer and the cure I was just about wiped out. I had no energy and pretty much left my garden to the weeds. It has been over a year now, nine months since my last chemo voodoo cocktail and I am regaining my strength. That too is a very long process, day by day. I am left with neuropathy in my hands and feet and a continuing shortness of breath, not so bad that I need a resperator but enough to keep me out of racing, no more marathons for me! I am discovering that I can do anything that I used to be able to do, just a little slower. It is an altering of time and not chastizing myself for being slow to get there. Except for the clean up and spit polishing I have completed the new entry to my studio and am happy with it. Now I am on a roll. Job in process, new entry to my garden. My garden area is about 25' X 50' and the entire area is a raised bed, about 16" higher than the surrounding walkways. At one time it was framed in used railroad ties, popular in the '70's and discovered poisonous in the '80's. I have replaced them except for the very front section with concrete curbing. Now I am replacing that. These railroad ties are 9' long and might weigh over a hundred pounds each. With the help of a steel bar, one by one they come out, like removing this cancerous crap from my garden! I got them out in about four hours and then I rested. For two days! 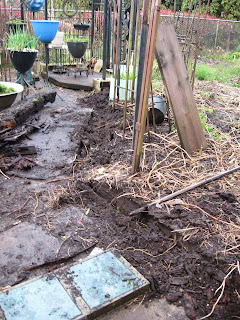 I am better today and will clean up this mess and set forms for the new concrete curbing. Then I will probably rest for two more days! Then I will pour the concrete! That's how I do it, little sections at a time and before I know it the job will be done! It is not a fast job but it is a continous process. When it is done I will post a photo of it. Lots of garden photos are HERE. That's a big project you're taking on... I'm leaving my garden to itself for now - but when I'm better, I'm going to have a huge task! Marvellous Jerry just marvellous. I am just home from the mountains and will go down see how my plot is looking tomorrow first thing I bet it is full of weeds. Glad to see you so well.